Your Wedding, Officiated YOUR way! You want it to be special. You want it to be an event that you will fondly remember forever. Why settle for a ceremony that doesn't reflect you and the love you have for one another. Rev. 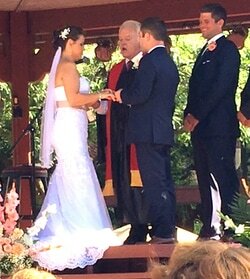 J. Patrick McDunn, a duly ordained minister, can work with you to make your ceremony one that people will talk about forever. Whether it is a Christian, Muslim or Nondenominational ceremony, Rev. J. Pat can help you to customize your vows or let you write your own vows to make your wedding day an event you have always imagined it to be. Include such time-honored traditions as Hand-Fasting, Jumping the Broom or The Sand Ceremony. Rev. J. Pat, in his 30+ years officiating weddings wants you to feel comfortable and at ease about one of the most important days of your life. Call today to schedule a free, no-obligation meeting, and see how your wedding can be the day you have always dreamed it would be!